Home / Articles / 2018 / Are Sugars the New Public Enemy No. 1? Sugar has never been such a public enemy. Blamed for obesity, contributing to heart disease, diabetes and other health threats, sugar is the cause of additional taxes on sodas, is what consumers are trying to eliminate from their diets, and has even been given a second line on the upcoming Nutrition Facts panel. Added sugars will be called out on a separate line on the FDA's updated Nutrition Facts panel, which originally was to become the rule this July 26 but has been delayed indefinitely, probably till January 2020. Whole fruit, fruit pieces, dried fruit, pulps and purees (which contain intrinsic sugars) are not considered added sugars. If a fruit juice blend is reconstituted such that the sugar concentration is less than what would be expected in the same amount of the single-strength juice, the added sugar declaration would be zero. But if the sugar concentration is greater, the amount of the excess sugar must be declared as added sugars. Such a scarlet letter may prompt some companies to reformulate products to minimize how much sugar has been added. Or if they find a suitable way to swap sugar with alternative sweeteners, formulators may face higher costs, supply issues or consumer challenges tied to these "artificial" ingredients. Still, consumers admit they can't live without a sweet taste. So researchers at food giants, startups and universities are looking for new ways to make foods sweet without putting people's health at risk. Nestle's close, though, as researchers have restructured sugar so that 40 percent less could be used in certain products. This hollowed-out sugar molecule dissolves rapidly when eaten but is perceived to be just as sweet, allowing consumers to taste it immediately. But that's the problem. The structure dissolves in water, which is present in most foods. Luckily for Nestlé, chocolate is one of the few foods that's not aqueous. A study released by the Consumer Goods Forum (www.theconsumergoodsforum.com) found the 102 food companies it surveyed reformulated more than 180,000 of their products to "support healthier diets and lifestyles, and address public health priorities." Hershey will "kiss" a lot of sugar goodbye with its goal of reducing the calorie counts in half of its individually wrapped standard- and king-size candy bars to 200 calories or fewer by 2022. To do this, Hershey will reformulate some treats, introduce new ones and adjust the sizes of others. Replacing conventional sugar with non-nutritive sweeteners can be difficult if the sweetness values or physical and chemical properties of the substitutes differ greatly from those of sucrose. Liquid sweeteners like honey and agave offer flavor and texture and, like sucrose, can assist with functionality like caramelization and color, fermentation/preservation, tenderness, creaming and possibly bulking. But such liquid sweeteners don't work for everything, and are deemed "added sugars" in the final Nutrition Facts update ruling. 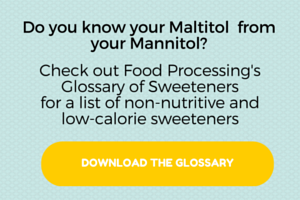 Sugar alcohols, such as sorbitol, xylitol, lactitol, mannitol, erythritol and maltitol, are used as both natural sugar substitutes and food additives. They're popular mainly due to their lower caloric values and glycemic indexes as well as anticariogenic effects. Their sweetness varies from 25 to 100 percent as sweet as sugar and often are combined with other sweeteners in sugar-free candy and chewing gum, cookies and other treats. Sugar alcohols sometimes come with gastrointestinal side effects, however, the most common problem being bloating and diarrhea. Fortunately, there are more sugar alternatives for product developers to choose from now than at any time in history. The favorite may be stevia, which is 200 times sweeter than sucrose, yet is non-nutritive. And it comes from a plant, not a test tube. As of August 2017, stevia was used in 27 percent of new products launched using high-intensity sweeteners, Mintel reports. The top categories for new stevia-based products included snacks, carbonated soft drinks, dairy, juice and other beverages. To combat stevia's bitter aftertaste, food scientists have isolated and extracted more palatable substances such as steviol glycosides reb-D and reb-M, and are also said to be sequencing the stevia plant's genome, in efforts to find out more about its glycosides and how to effectively use them. Both Coca-Cola and Pepsi-Cola have had colas sweetened with stevia, but each found limited success. Perhaps that's because they contained a significant amount of calories, having relied on some sugar to combat the sometimes metallic or bitter aftertaste of the stevia. Late last year, however, Coke announced it was testing in international markets a zero-calorie cola with no sugar, using a harder-to-extract glycoside of the stevia plant, rebaudioside M.
Heylo is a combination of acacia fiber (a.k.a. acacia gum) and water-extracted stevia, according to Israeli entrepreneur Yuval Maymon at Unavoo Food Technologies (unavoo.com). He claims the flavor profile is indistinguishable from sugar, and it should be able to eliminate added sugar and artificial sweeteners from food and drinks. "Heylo won't change a formulation's viscosity, density or pH, and is extremely stable under most processing/storing conditions," says chief marketing officer Jeremy Cage, a former PepsiCo executive. Plant-based Sucari from U.K.-based Cambridge Commodities (us.c-c-l.com) combines inulin, a chicory-based prebiotic fiber, with xylitol and stevia to deliver a taste, texture and mouthfeel similar to conventional sugar with a fraction of the calories. The company says it won't cause spikes and crashes in blood sugar levels. Beneo's (www.beneo.com) prebiotic chicory root fiber and oligofructose also can help cut sugar. The company is also working on "stealth sugar" developments that provide "enhanced balanced energy, bulk and mouthfeel," says Rudy Wouters, vice president of the Beneo Technology Center. "Stealth sugar reduction can vary between 10 and 20 percent per reformulation. Most companies seem to be aiming for 10 percent as a target, allowing consumers’ palates to gradually get used to mild sweet tastes." Monkfruit, which is 200 times sweeter than sucrose, is seeing more use in ice creams, yogurts, teas, juices, flavored waters and baked goods because a little goes a long way. It's also being blended with stevia and allulose in KetoseSweet, a new sweetener from Icon Foods (formerly Steviva Ingredients). Like stevia, monk fruit extract is available commercially under a few brand names, such as Monk Fruit In The Raw. "We're evaluating organic monkfruit as a complementary ingredient to organic stevia," says Phillip Coggins, senior director of commercial sales at Pyure Brands LLC (pyureorganic.com). "The supply and extraction processes pose some challenges and monk fruit pricing reflects these challenges," he says. Coggins thinks major food and beverage manufacturers have been actively replacing added sugars for a while. "It has become a necessity to steer away from chemical sweeteners and [use more] naturally derived options. Every application has its own uniqueness. The key is striking a good balance between the ingredient deck, product functionality and marketing strategy." Consumers seem to be open to trying new foods with healthier ingredients, Coggins sums. "A few years ago, the average person never even heard of stevia or erythritol, and now, these ingredients pop up in some of the most mainstream beverages available. It speaks to how quickly consumers have accepted naturally derived sweeteners and how their preference for better-for-you products can even supersede brand loyalty." Calling out ‘added sugars’ on the Nutrition Facts panel will confuse consumers.